Products made by AZEK Building Products include premium composite decking and railings. WILMINGTON — AZEK Building Products plans to add dozens of new jobs over the next three years at a second facility in Wilmington that the composite decking company recently bought. AZEK Building Products makes the TimberTech brand of decking, and TimberTech is the brand that will utilize the plastic material produced in this new facility. The new manufacturing facility, about 100,000 square feet in size, is Building 4 located off Progress Way in the Commerce Park near the Wilmington Air Park. The AZEK Company — AZEK Building Products’ parent company — is committed to making high quality building products that are based on recycled materials, added Stanhope. “This new facility is just one example of the work that is being dedicated to this endeavor,” he said. The mayor added he likes the fact the city’s economy is becoming more diversified than it has been at times in the past. Stanforth also said the company makes excellent products — materials he used on the job before he retired from his John Stanforth Construction business. 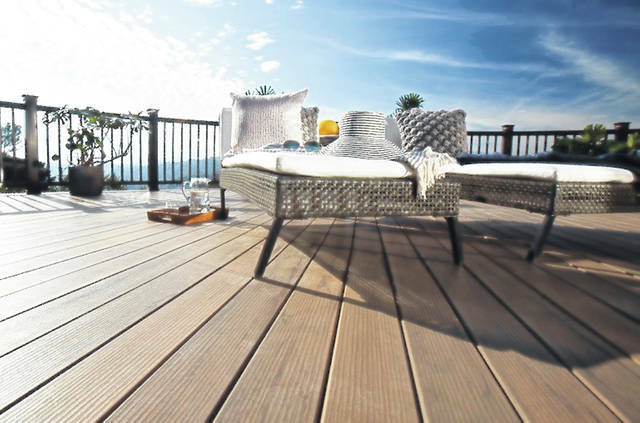 AZEK Building Products makes a line of composite decking that contains predominantly wood and plastic. The wood is sourced from recycled floors, cabinetry, and so forth. The plastic portion is composed of bottles, films and other materials that are also being repurposed into TimberTech decking. The new facility, said Stanhope, will enable AZEK Building Products to convert the post-consumer and post-industrial plastic materials into a blend and a form that the company can use directly in its decking process. There is a major investment to make the facility capable of being utilized for the work to be performed there, he said. This includes electrical upgrades, a quality control testing laboratory, and structural upgrades — to name a few changes to the structure. The remodeled building is being designed for both short-term needs as well as the ability for internal equipment expansion as output is increased, according to Stanhope. “We anticipate that we will be using the plastic processed in the new facility this fall,” he said. Operations at the new facility will mark the first time this particular process is used in the United States, said the vice president of Research & Development. It also will be the first time the process is used as part of a continuous, integrated system, Stanhope added. “We are very excited about the opportunity to grow jobs in Wilmington,” said Stanhope. According to a January 2018 press release from the company, “A central part of The AZEK Company’s strategy for growth is a strong focus on reusing recycled plastics and turning them into superior residential and commercial building products that outlast wood and other raw materials. “The company’s three divisions — AZEK Building Products, Scranton Products, and Vycom — all convert recyclables into a diversified suite of products. Over the past five years, AZEK Building Products alone has saved more than 900,000 trees, setting The AZEK Company apart and giving it a distinct competitive advantage in the building materials space,” stated the release. The AZEK Company LLC is headquartered in Skokie, Illinois, part of the greater Chicago area. The company also operates manufacturing facilities in Wilmington, Ohio on Prairie Avenue and in Scranton, Pennsylvania. The company’s products are marketed under several brands, including AZEK and TimberTech for residential building materials, Scranton Products for commercial building materials, and Vycom for industrial building materials. For more information, please visit TimberTech.com . https://www.wnewsj.com/wp-content/uploads/sites/22/2018/08/web1_timbertech_legacy_tigerwood05-2.jpgProducts made by AZEK Building Products include premium composite decking and railings.